Ground fault circuit interrupter (GFCI) electrical receptacles are mandated by standard electrical building codes during residential wiring installation by licensed electrical contractors. What exactly is this electrical ground fault protection and why do you need it? Consider some basic facts of nature that you might be acquainted with. You know that water always seeks its own level in a water level. In such a manner electricity always looks for the most effective route to go to ground. And that is why commercial office buildings use grounded lightning rods to keep inhabitants safe. When lightning strikes, the metal rods on the upper levels of the structure route the electrical charge to the ground, bypassing the contents and people in the building. Well, thats just the way it is with your homes electrical wiring. Imagine when a bare electrical wire housed in a metallic kitchen appliance finds itself in contact with the metal housing. What happens? Now the metal outer part of your appliance becomes electrically energized. Suppose you, as the cook, grabs the appliance with your left hand and your sinks faucet, properly grounded, with your right hand. The deadly result is that a potentially lethal current is sure to flow through your body. You becomes the electron flows shortest path to ground. To avoid this potentially deadly situation, GFCI (Ground Fault Circuit Interrupter) receptacles are installed it kitchens and bathrooms and some other areas by code. How Does the Circuit Interrupter Work? The GFCI receptacle continually monitors the circuit its installed on. When a situation that threatens an electrocution emergency occurs, the GFCI immediately breaks the connection, like a circuit breaker. The person involved will most likely still experience an electrical shock. Uncomfortable but not life-threatening. Where in Your Home does the Building Code Require GFCI Receptacles? The electrical building code requires these in certain circumstances. The common denominator is any environment where water and moisture are likely. This means outdoor lighting applications, bathrooms, unfinished basements, kitchens, garages, and crawl spaces. The code mandates are specified in the National Electrical Code. Of course all residences arent completely up to code because of when the home was built or because rooms were added on. For instance, outdoor receptacles were added to the NEC in 1973 and unfinished basements were included in 1990. Oddly, requirements for installing GFCI receptacles when wiring kitchens wasnt added until 1987. 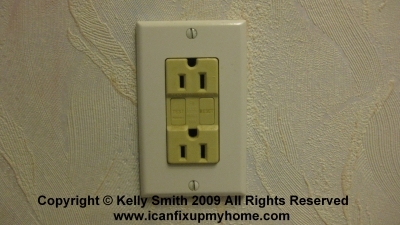 Any homes that are not up to code on GFCI receptacles should consider installing them. Theyre cheap, but human life is priceless. Before beginning a wiring project, its important to understand home wiring concepts. Youll notice 2 buttons on the unit; Reset (usually red), and Test (usually blue). Begin by plugging a light into it. It should light up. The light should go out, and the Reset button should pop out. If Reset pops but the light stays on, the receptacle is probably wired incorrectly. Rewire it. If Reset doesnt pop out, this indicates that the GFCI is faulty; toss it out and replace it. If everything tested properly in step 3, everythings fine. Press Reset and repeat next month! Did you find this article helpful? Please help keep this site free with a small donation! © 2007-2009 Kelly Smith all rights reserved; content may not be copied, rewritten, or republished without authors written permission.